WOODBRIDGE: As organ music played in the back-ground, Jack and Sheryl Courtney kicked up their heels in unison as they glided across the floor at the United Skates of America rink at the Woodbridge Community Center. 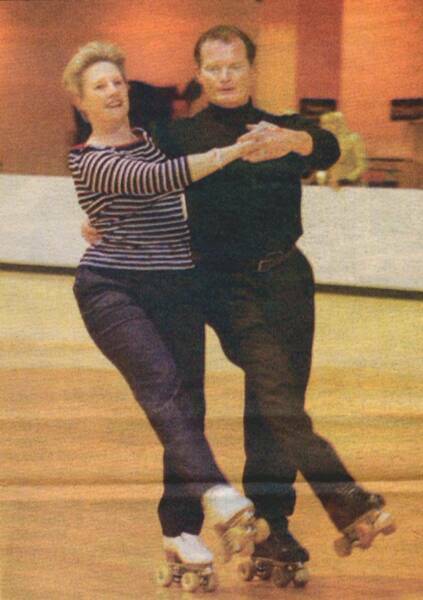 Although nearly 40 years have passed since the couple took the 1968 World Pairs Champion title, they haven’t lost their touch. The couple from Colorado Spring, Colorado, won first place in the Werner Tango Competition at the United States Amateur Roller Skating Association’s reunion earlier this month. Professional and amateur skaters, who skated from 1942 to 1970 descended on the roller rink May 17-18 for the reunion. The event included a day at the rink during which some of the skaters climbed back into their skates and bobbed and weaved around the smooth-surface floor. They reminisced about the past and caught up on recent activities. They hovered over scrap books filled with photos and articles from days gone by. A banquet was held later that evening and lifetime achievement awards were given to honorees. More than 175 guests, including skaters and their spouses, coaches, judges and friends attended the 2007 association’s reunion, organizer Jim Kohl said. “We held a reunion in 2005, but I wasn’t able to locate a lot of the skaters,” he said. “I had no list to go by. I had to find them on the Internet. Once word of the 2005 reunion spread, there was an interest in holding another, he said. The organization was formed in 1942, said Kohl, who is a resident of Mansfield in Burlington County. The group made up of roller-skating clubs based out of South Amboy Roller Rink and Kendall Park Roller Rink, Kohl said. In the early 1970’s the association merged with the Roller Skating Rink Operators Association to form the USA Roller Sports, he said. A group of skaters, who were unhappy with their merger, formed the National Amateur Roller Skating Association, which held its National Competition at the Kendall Park Roller Rink, he said. The United States Amateur Roller Skating Association “had some of the strongest competitive skaters around, “ Kohl said. “They competed in interclub meets, state championships and the Nationals. Skaters also competed in the annual America on Wheels championships. The best skaters also competed in the Pan American games and World Championships. 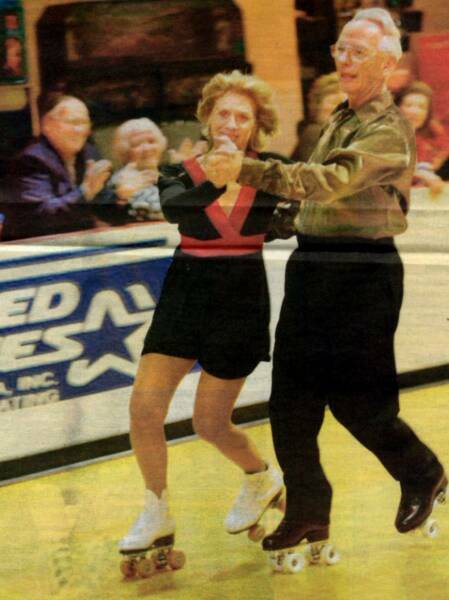 Gladys Werner, 82, of Palm City, Fla., a recipient of the reunion’s lifetime-achievement, is one of those skaters. She and her husband, George, are three-time national dance champions, winning the title in 1941, 1942 and 1946. “My husband was a pilot in the war, so we had to skate around that,” she said “skating was our lives, and we loved every minute of it. We met so many wonderful people. It was so much fun. In fact, the couple went on to teach skating. Many of their students became national and world champions. The couple even wrote a tango, which was the featured dance at the reunion’s competition. Ed Daly of Toms River also attended the reunion. “I skated from 1953 to 1962, “ he said. “I loved to skate and compete. It was so exciting. The reunion is a wonderful opportunity to meet with people you haven’t seen in years. An event like this probably won’t come again. “I’ll probably get the award for coming the longest distance,” said Barbara Karaway Widmann, who came all the way from Fiji. “Why wouldn’t I” It is so worth it all. We’re a family of skaters. This is more like a family reunion than a skating reunion. There are so many people I haven’t seen in 50 years, but I still recognize the faces. Carol Wagonseil skated around the floor, stopping every now and then to chat with friends. Hastleton said, when she heard about the reunion, she had to come. Although she retired her skates many years ago, Hastleton, who now lives in Florida, said she recently decided to start again. Audrey Faulkner of Sewaren was a reunion attendee. Additional information about the organization and its reunions is available on the Web at www.usarsarollereskaters.org. Barbara Jablonski Collins of Clark and Jim Kohl of Columbus, NJ compete in the Tango contest at the US Amateur Roller Skating Association Reunion and Competition. Eight couples competed- Barbara and Jim placed fourth.